Ages of the Rocks Units and Superficial Deposits. Cadomian from Cadomus, latin for Caen, capital of Normandy. Brioverian from Briovère, type area and Gaulish name for St. Lô in central Cotentin. In addition to a Bibliography page, references are also given in text and more fully below each page. Ref. Brown et al. 1990. p. 195. The oldest rocks in Jersey are the sedimentary rocks of the Jersey Shale Formation but as no fossils have been found in them yet, it has been difficult to date them. By comparison with similar sedimentary formations and associated rocks in Brittany they have been dated as Brioverian, forming part of the Upper Proterozoic of the Precambrian. They are thought to have been deposited between 660 - 540 Ma ago, these dates being based on isotopic analyses of U238 - Pb206, and folded during the Cadomian Orogeny. The overlying sequences of the St. Saviour's Andesite, St. John's Rhyolite and Bouley Rhyolite Formations are considered to be 533 Ma old or older and therefore seem to be Cambrian in age based on Rb:Sr dating. The three granite masses forming the SW, NW and SE corners of the island are not of uniform composition throughout and form granite complexes, the individual parts of which were intruded at different times. These too, have been dated using Rb:Sr. The South-west granite (SW granite of the map) consists of three types cropping out in concentric bands open to the south (Bishop & Bisson, 1989, p. 55). The oldest is the La Moye granite, a porphyritic granite, forming the middle band around the central mass of the Beau Port aplogranite (the St. Brelade's granite of the 1:25,000 map), both being surrounded by the coarse-grained Corbière granite which forms the outer band. An Rb:Sr whole-rock isochron age of c. 553 Ma, recalculated from c. 565 Ma is given by Bishop & Bisson (loc.cit.). They therefore seem to have been emplaced in Cambrian times. Brown et al. (1990, p. 195-6) describe this granite as the Southwest Granite Complex which consists of an outer Coarse Granite, a middle Porphyritic Granite and an inner Microgranite. The whole rock isochron ages, supported by "field relations, geochemistry and petrogenetic modelling" are given as follows; the intrusion of the middle Porphyritic Granite c. 550 Ma years ago, the inner Microgranite at c. 527 Ma and the outer Coarse Granite at c. 483 Ma years ago. These dates also indicate intrusion during Cambrian times but extending into Ordovician times. 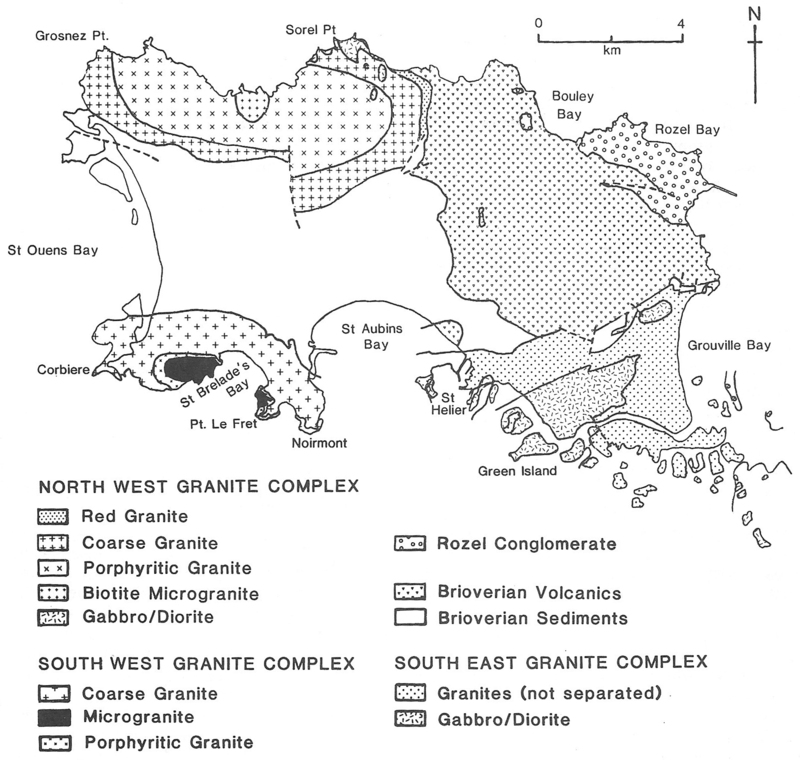 The North-west granite (NW igneous complex of the map) consists of the coarse grained St. Mary's granite and the Mont Mado aplogranite and gabbro-diorite masses (Bishop & Bisson, 1989, p. 52-54). The Rb:Sr whole-rock isochron age is given as c. 480 Ma recalculated from c. 490 Ma. No ages are given for the Mont Mado aplogranite or the gabbro-diorite masses. Further east, the Belle Hougue igneous complex consists of altered diorite 'veined and brecciated by granite' similar to the north-west granite (loc.cit. p. 54-55). Brown et al. (1990, p.195 - 6) describe this granite as the North West Granite Complex consisting of four granites in a concentric arrangement open to the north, an outer Coarse Granite, around a Porphyritic Granite which surrounds a central Biotite Microgranite. The fourth which crops out along part of the eastern edge is described as a Red Granite. The oldest is the central Porphyritic Granite dated at c.465 Ma, followed by the outer Coarse Granite dated at c. 438 Ma and the youngest on the eastern side is the Red Granite dated at c. 426 Ma. No ages are given for the central Biotite Microgranite or the gabbro-diorites. They therefore seem to have been intruded during Ordovician and early Silurian times. Parts of this complex are described and colourfully illustrated in more detail by Bishop, Keen, Salmon & Renouf (2003, p. 33-37) who give details of associated granodiorites. The South-east granite consists of three different granites and also contains masses of altered gabbro and diorite but they do not occur in three concentric outcrops nor are they aligned as once thought. The granites comprise the Ft. Regent/Elizabeth Castle granophyre, the Dicq granite, the Longueville granite and La Roque granite (Bishop & Bisson, 1989, p. 56-60). The dating of them remained unresolved in 1989. An Rb:Sr whole-rock isochron age of c. 509 Ma (recalculated from c. 520 Ma) for the south-east granite is discussed along with an age of c. 570 Ma for the Dicq/Longueville granite and c. 580 Ma for the emplacement of the gabbro and diorite (loc.cit. p. 59). These dates suggest that intrusion occurred from late Proterozoic time through the Cambrian and just into early Ordovician times. However, as no reliable dates have been obtained for these igneous masses and the one date and the combination of rock types indicate that they may be coeval with the North-west granite/igneous complex (between 465 - 426 Ma old), a problem remains. Brown et al. (1990, p. 196) did not illustrate the granites of the South East Granite Complex but described them as follows; a megacrystic Dicq Granite passing northwards into the Longueville Granite; a younger, coarse-grained partly pegmatitic Le Hocq - La Roque Granite passing north eastwards to become the finer grained, a quartz - poor Gorey - Mont Orgueil Granite, and finally, the Ft. Regent - Elizabeth Castle Granophyre. The age relationships with the gabbroic/dioritic rocks were discussed and it was thought that co-mingling probably took place over a restricted time interval. The Jersey dykes are beautifully exposed along the coasts and comprise various dolerite, lamprophyre, acid-porphyry and rare rhyolite types. They intrude all the major rock units and are of different relative ages as interpreted from their cross-cutting relationships and their positions in the host rocks; their intrusive sequence is difficult to determine (Bishop & Bisson,1989, p.68- 70). Results of studies by other authors are also included, for example, palaeomagnetic studies (Duff, 1980) which indicate ages of different groups of dykes from late Precambrian to Carboniferous, and mica lamprophyre studies of the Armorican-Hercynian belt in Europe (Lees, 1982) which indicate a Carboniferous to early Permian age. The Jersey Main Dyke Swarm (Lees, 1990, p. 273) is the name given to the concentration of dolerite, lamprophyre and feldspar - quartz porphyry dykes which have intruded the rocks mainly in the southern part of Jersey. The absolute age of emplacement is unknown but they are younger than the youngest granites in the three complexes at 483 - 426 Ma and younger than 440 Ma obtained from biotites and amphiboles by K-Ar in the SE Jersey complex. Here, they are cut by marginal veins of Le Hocq granite which indicates a short time interval between the two periods of intrusion (loc. cit. p. 276). The Rozel Conglomerate Formation lies above the eroded surface of the Bouley Rhyolite Formation, dated at c. 533 Ma (Duff, 1978) but this may be the date of the intrusion of the nearby granite (Bishop & Mourant, 1979). The conglomerate is intruded by a dyke dated at 427 Ma (Adams, 1967) but this is regarded as a tentative upper age limit (Went & Andrews, 1990, p. 299). If it was deposited between those dates, and the duration of the erosion time gap above the rhyolite is unknown, it would seem to make it largely Ordovician - Silurian in age. Jersey's youngest deposits are the superficial ones on the raised beaches, then the glacial head and loëss, followed by the peats and sands. Three raised beach levels are recognised, the highest at 30m the deposits of which are thought to be pre-Ipswichian (older than 130,000 years) as are the lower (younger) 18m raised beach deposits, whereas the lowest 8m deposits are thought to be Ipswichian / Eemian in age, between 130,000 - 115,000 years BP (Jones et al. 1990 p. 3). Overlying these is the St. Peter's Sand, the lowest aeolian sand, also possibly Ipswichian , which in turn is overlain by the glacial head unit and the loëss, both considered to be Devensian (115,000 - 10,000 years BP) forming the top of the Pleistocene. The peat and alluvium and the recent blown sand are considered Flandrian and the most recent in the Holocene, having formed in the last 10,000 years BP. Variously coloured clays, presently being mapped by Dr. A. Hill (pers. comm.) occur in the littoral zone around and on the SE granite about La Rocque, and underlie present day beach sands and gravels. If equivalent to the clays onshore (loc.cit, p. 77 (section)-88), they may represent Recent loess or alluvial deposits. Adams. C. J. D. 1967. K-Ar ages from the basement complex of the Channel Islands (United Kingdom) and the French mainland. Earth and Planetry Science letters 2, p. 52 - 56. Bishop. A. C. and Mourant. A. E. 1979. Discussion on the Rb - Sr whole rock age determination of the Jersey Andesite Formation, Jersey. C. I. Journal of the Geological Society, London, 136. p. 121. Bishop. A. C., Keen. D. H., Salmon. S. & Renouf. J. T. 2003. The Geology of Jersey, Channel Islands. Geol. Assoc. Guide No. 41. Brown, M., Power, G. M. Topley, C. G. & R. S. D'Lemos, R. S. 1990. Cadomian magmatism in the North Armorican Massif. p. 181 - 213, in The Cadomian Orogeny. Eds. D'Lemos, R. S., Strachan, R. A. & Topley, C. G., 1990, Geological Society Special Publication No. 51. D'Lemos. R. S., Strachan. R. A. and Topley. C. G. Eds. 1990. The Cadomian Orogeny. Geol. Soc. Spec. Publ. No. 51. Duff. B. A. 1978. Rb - Sr whole rock age determination of the Jersey Andesite Formation, Jersey, Channel Islands. Journal of the Geological Society, London, 135. p. 153 - 156. Duff. B. A. 1980. The palaeomagnetism of Jersey volcanics and dykes, and the Lower Palaeozoic apparent polar wander path for Europe. Geophys. J. R. Astron. Soc. Vol. 60, p. 355 - 375. Went. D. & Andrews. M. 1990. Post - Cadomian erosion, deposition and basin development in the Channel Islands and northern Brittany, p. 293 - 304 in The Cadomian Orogeny, Geol. Soc. Spec. Publ. No. 51. (see D'Lemos et al. above).